What is this force that threatens to derail your effectiveness, your legacy, and maybe your entire life? It is insecurity. It is the result of fear, and just as fear has some home in every person’s life, so does insecurity. It cannot be destroyed for it will never be eliminated, but insecurity can be dominated, defeated. 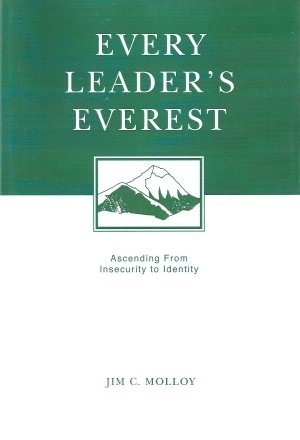 “Everest” is not a generic book about leadership. It is a book about spiritual leadership, especially ministry-related leadership. However, anyone that struggles with insecurity, whether at home or work, alone or in groups of people, will benefit from Jim’s book. One might think that the key to defeating insecurity is becoming more sure of ourselves. While we can identify insecurity in our lives and try to restructure our lives to avoid and combat it, only the supernatural power of God defeats insecurity in our lives. Insecurity is often a result of deficiencies in our understanding of and faith in God. “…insecurity is not defeated by becoming surer about our leadership but rather by beings absolutely sure about God” (12). Jim identifies many ways that people are overtaken by insecurity. In many cases, we don’t even realize that we are insecure, but the carnage of insecurity lie all around us. Insecurity can be cause by pain, the gifts God gives to us for ministry, and unresolved personal issues. One particularly interesting chapter gives life to insecurity as Jim describes various personas overtaken by it. The latter section of the book deals with re-scripting our hearts and minds. Too often we can receive what others think about us, our gifts and our ministry. Instead we must reprogram ourselves with what God says about these things. Later chapters visit these new Life Scripts in order to feed the truth into us. Insecurity is fear. Unhealthy fear is always the result of a lie. Security knows that being “free from fear” is an illusion. If one’s path into leadership is void of obstacles, chances are that the path didn’t lead anywhere significant. Without challenges, the reward of arriving at the destination isn’t as sweet. …leadership without hope is weakened because leaders live in the hope that things will change. You can still find God in the midst of unanswered questions. You just have to accept that you will never have all the answers. If you are arrogant, everyone knows it. Most are just too gracious to tell you. Do you need leadership or does leadership need you? If we refuse to explore and acknowledge our proneness to specific issues, we condemn ourselves to the mercy of pride and arrogance. Do things because they matter to God, not because they get you noticed. If you did all the things you could do, you would drive yourself crazy. If you only judge your worth by your measure of your economy, you will be insecure. …it is always better to be detested by your courage than esteemed for following the crowd. You can find out more about Jim Molloy, Life Scripts, and more at his website, www.leaderscripts.com. Next ›How Bad Can I Be?